Beach: Short drive Mayflower, Corporation, Cold Storage. 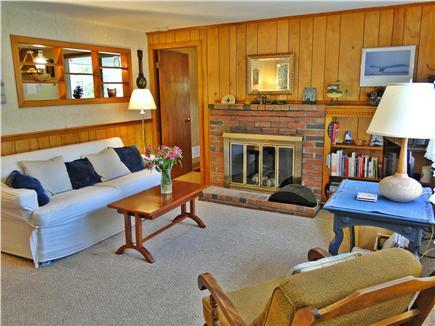 Enjoy a relaxing vacation in this comfortable, clean ranch-style home with central air/heating. The large, private backyard has Adirondack chairs--you can relax, enjoy fresh evening breezes, view of pine trees and sky. 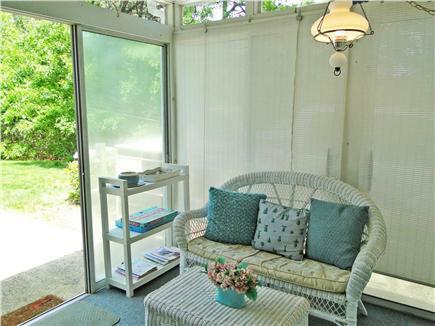 Have morning coffee, plan your day in the sun room or patio with back yard view. 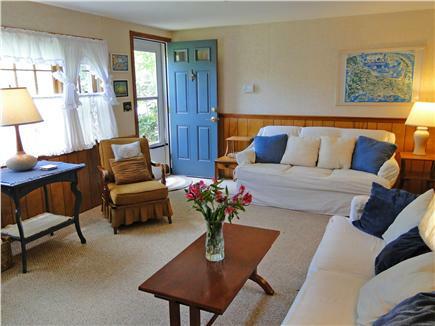 Sun room has comfy wicker furniture, patio has outdoor dining table and chairs with umbrella. Scenic and protected Bayside beaches (Mayflower, Corporation, Cold Storage)are close by, as are beaches on Nantucket Sound (West Dennis Beach). After a day of sand and sun, enjoy a refreshing outdoor shower in the enclosed hot-cold shower. Grill a great meal with your choice of Weber gas grill (propane included) or Weber charcoal grill. A lobster pot is available to cook the Cape's own lobsters. The house is in a pleasant neighborhood away from traffic, great for safe walking/biking. A large grocery store, gourmet food shops, and restaurants are nearby. If you need just a few basic necessities a small convenience store is four minutes away. If you prepare meals, our kitchen is fully equipped with pots, pans, dishes, utensils, BBQ tools. Our house is thoroughly cleaned by professional cleaners before the summer season and is again cleaned before guests' arrival on check-in day. There is no cleaning fee. Appliances are those at your own home: washer/dryer, dishwasher, gas range/oven, microwave, coffee maker, toaster, blender, toaster oven. A 32-inch Sony HD-TV with satellite/DirecTV and DVD player is in the living room. Beach chairs and cooler are available to take to the beach. We supply kitchen towels, oven mitts, dishwasher soap. 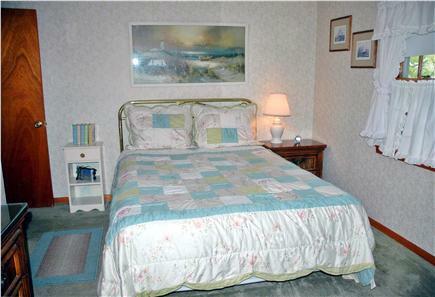 There's an ample supply of pillows, blankets, bedspreads, mattress pads for every bed. Mattresses are comfortable; most new. We supply bed linens for a reasonable fee. Bath/beach towels are not supplied. We have an FM-AM radio with CD player, selection of CDs and DVDs for different ages, playing cards, board games for kids/adults, outdoor games children can play in the backyard. Verizon MiFi is available or use your Air Card, Hot Spot, Jet Pack. We have excellent reception. 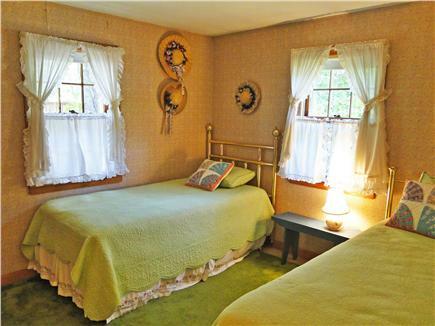 Guests can comfortably share the house as it has a convenient layout - master bedroom with queen bed; bedroom next to master has two twins, third bedroom on opposite side of the house has double bed and twin. 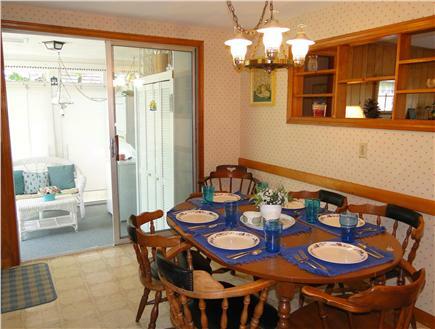 All rooms except the sunroom are on one level so easy to navigate. The sunroom is just one step down from the kitchen, another step to the back yard. Front entrance has two steps. Two shopping centers are in easy driving distance, one has a Stop N'Shop, the other has gourmet shops offering sandwiches, soups, beverages, a D'Angelo's for a great lobster sandwich, and Dunkin' Donuts. 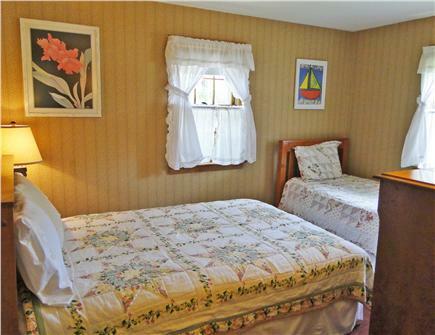 Starting August 26 through September, prices are lower, perfect for a couple to become acquainted with all Cape Cod has to offer. Families with young children enjoy less-crowded beaches, warm days, mild nights. In off-season, beach parking is free. In September, enjoy scenic aspects of beaches or even swim, walk/bike nature trails, spend time sightseeing, shopping. Most attractions and shops are open in September. Ferries to Nantucket, Martha's Vineyard operate year-round. Spend a relaxing evening watching satellite TV. An ''information binder'' is available with directions to Dennis beaches, golf courses, and restaurant suggestions. Please note the 30 reviews shown here that were written in our Guest Book by guests who enjoyed the house and location the past 12 years. Dennis is a great town, picturesque, historic, judged one of ''the best American towns''. It's in the center of Cape Cod so easy to get to other Cape towns for sightseeing or just a great place to stay and ''get away from it all''. 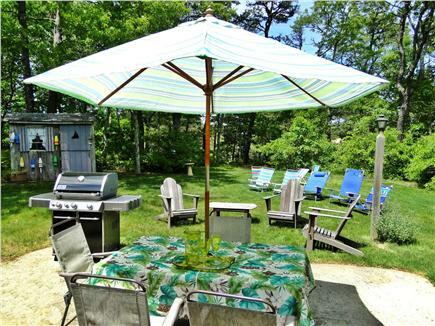 This house was featured on NECN's TV program in 2012 as a great value in Cape Cod vacation rentals. In Dennis, you'll enjoy the best of ''Old Cape Cod'' as well as the new Cape Cod and leave with great memories! Two golf courses--a 2-3 mile drive from our home. Greens fees are reasonable in summer. Fees go down after Sept 5, again after Oct 10. Several miniature golf are closeby on Rte. 28. Visit historic sites/museums, quaint shops, antique stores on nearby Rtes 6A and 28. Cape Cod Rail Trail-a quarter mile away-for walking, biking. Bring bikes or rent at Barbara's Bike Shop near the Rte 134 Trail entrance. Bike all the way to Wellfleet (25 miles) or stop along the way. Pleasant Lake Store (at 5.9 miles) is a good place for lunch, drinks, snacks. This paved Trail passes local points of interest - several lakes for swimming, picnics. You can also walk shorter trails in the towns of Dennis, Harwich, and at Nickerson State Park. Check out historic Cape lighthouses--Highland Light in Truro; Nauset Light, Eastham Light, Chatham Light. Enjoy a river cruise or kayak on nearby Bass River. Easily access Rte 6 for a day of shopping/dining in Provincetown, and great ocean views at Cape Cod National Seashore. Enjoy the many beaches (15-16 of them) in Dennis, either on Cape Cod Bay (Mayflower, Corporation), Nantucket Sound (West Dennis Beach) or local ponds. During summer months, vehicle stickers for a week's beach parking can be purchased at Dennis's town office. In off-season, parking is free. In summer, attend a performance at historic Cape Cod Playhouse on nearby King's Highway, or the children's theater. In fall, catch a sunset on Bayside beaches, enjoy the views at local beaches, or even swim, have an afternoon or early evening beach picnic, or a relaxing day or evening on the patio in our private backyard. Nearest beach: Short drive Mayflower, Corporation, Cold Storage. Additional pricing info: Multiple week discounts. No cleaning fees. Reasonable linen fees. State and local taxes of 12.45% will apply. Thank you for letting us use your place - it was awesome! The weather was great all week and we got a lot of beach time in. Thanks again! Very relaxing vacation. Great weather, close to beaches, shopping, and activities. 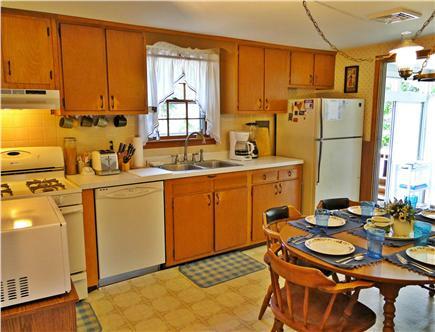 Great home with nice fully equipped kitchen, and quiet. Enjoyed our stay!! 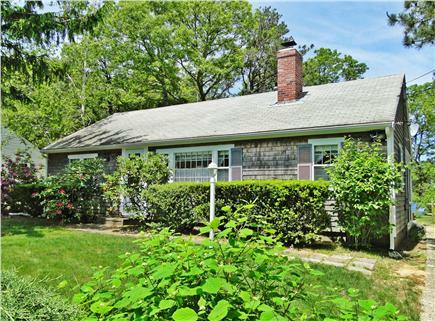 Thank you Joan and Tom for sharing your Cape Cod home. We had a great time and are so glad we stayed for the 2 weeks! Watching our son excel with the Orleans Firebirds was so great! My parent shared this vacation with four grandchildren ages 7 years-1 year old (and) my father's elderly mother. I came to spend the last couple days with them. We all had a wonderful time and loved this house. This is a vacation none of us will ever forget! Thank you for the memories! We had a wonderful two weeks in the house, enjoying the warm weather with frequent trips to Coast Guard, Nauset and Lighthouse Beach, as well as hanging around in the garden playing badminton and using the outdoor shower for refreshment. Thanks! Thanks Joan and Tom, The weather was lovely. The cottage had everything we needed. Very well stocked. We enjoyed ourselves. Thank you so much for a wonderful family vacation. The kids loved your house and we loved the location. Hope to return next year!